Tip the onions into a small shallow non-stick tin. 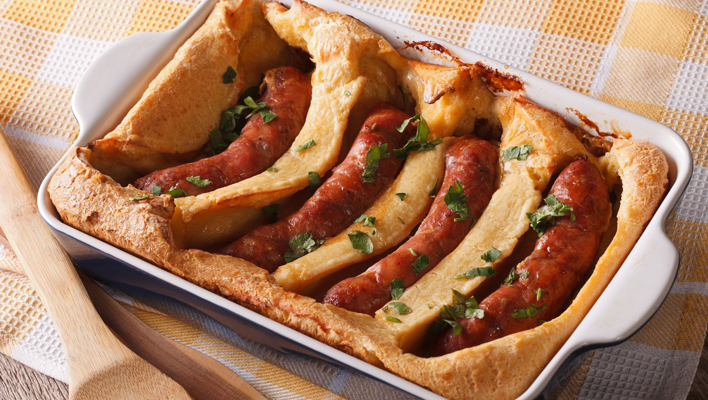 Arrange the sausages on top of the onions, then spray lightly with the Frylight and roast for 20 minutes. While they are roasting, make the batter. Sift the flour into a bowl, drop the egg into the centre and beat in the milk a little at a time until it makes a smooth batter. Stir in the mustard and thyme and season. Pour the batter into the hot tin and return to the oven for 40 minutes until the batter has risen and is golden. Pre-heat oven to 160°C/140°C Fan/Gas mark 3. Mix the mustard powder, paprika, ground black pepper and salt and rub this all over the pork, making sure you rub it into all the crevices. Scatter the onions and bay leaf in the bottom of a large roasting tin. Place the pork, rind-side up, on top of the onions. Pour 200ml water into the tin, wrap well in tin foil and cook for 4 hrs. Mix the ketchup, vinegar, Worcestershire sauce and brown sugar together. Remove the pork from the tin and pat dry. Place the roasting tin on the hob, pour in the ketchup mixture and heat for 10-15 minutess until starting to thicken. Remove the bay leaf and pour the sauce into a food processor; blitz until smooth. Smear half the sauce mixture over the meat. Grill the pork for 10-15 minutes on each side until a little charred. Place the pork on a large plate and remove the string. Peel off the skin and then using 2 forks, shred the meat into chunky pieces. 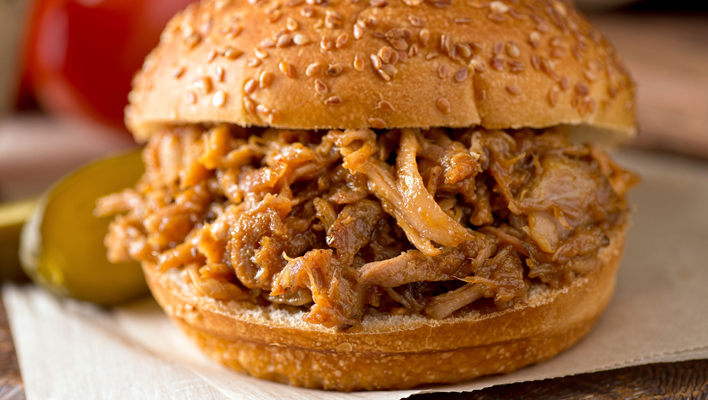 Add the barbecue sauce to the meat and toss everything well to coat. Pile into rolls and serve with extra sauce. 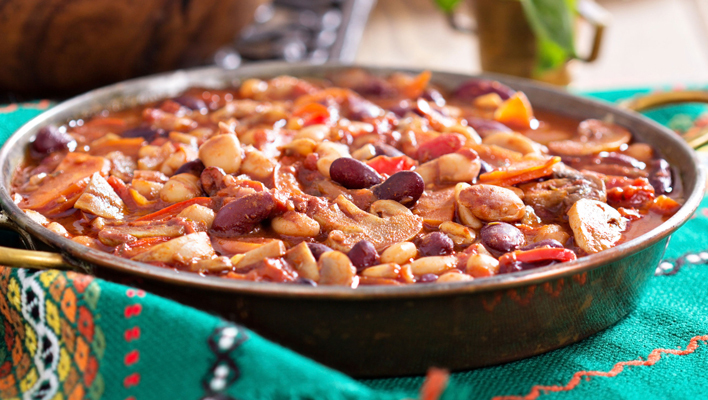 Using a slow cooker add the chopped tomatoes, kidney beans and borlotti beans. Add the chopped onion and top this up using the water. Add the chilli powder, ground cumin, salt and pepper. Cook on a low heat for a few hours. Mix all the spices with the crème fraîche and leave the mixture overnight. Hollow out the pumpkin and bake the pumpkin shell in the oven for 30-45 minutes at 200°C/180°C Fan/Gas mark 6, until softened. Dice up the flesh and once the shell has been cooking for 20 minutes, add this to the oven and bake for about 20-25 minutes. Whilst the pumpkin is cooking, dice the cauliflower, onion, garlic, mushrooms and fry in a saucepan with 2 tsp olive oil. When the pumpkin is cooked add it to the other vegetables along with the chopped spinach. Get the crème fraîche sauce out of the fridge and stir into the vegetables until warmed through. 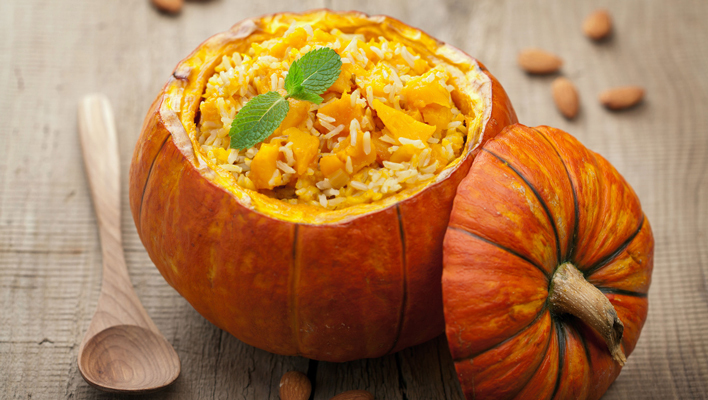 Mix in the cooked rice and spoon the mixture into the pumpkin shell to serve. Cream the butter and sugar together until fluffy. Beat in the egg. Next, stir together the flour, baking powder, cinnamon and toffee pieces and mix them into the creamed butter mix. Peel and finely dice the apple and immediately add it to the mix to stop it discolouring. Next, take two large pieces of cling film and sprinkle a line of oats down the middle of each. Scoop half the dough onto each and sprinkle with more oats, before using the cling film to roll the dough into a 1 inch wide sausage shape. Freeze for 20-30 minutes or chill in the fridge for an hour. Preheat your oven to 180°C/160°C Fan/Gas mark 4. Line a large baking sheet with baking paper. Take the solid cookie dough out and unwrap it before slicing each log into 8 pieces. 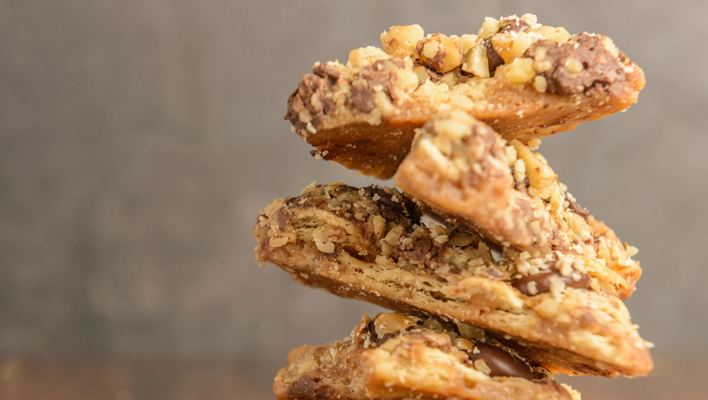 Place the pieces on the baking paper and top with any remaining oats. Bake for 12-14 minutes in the centre of the oven. The edges will be set but the middle a little soft. Remove from the oven and put the baking tray on a cooling rack and allow to cool.